This set of Geotechnical Engineering Question Bank focuses on “General Bearing Capacity Equation: Brinch Hansens Analysis”. 1. For purely cohesive soil, Nc has a maximum value of ___________ for square footing. Explanation: According to Skempton’s observation, for purely cohesive soil (φ = 0) Nc has a maximum value of 9 for square or circular footing. 2. The Brinch Hansen shape factor can be applied to ___________ for the case of rectangular footing. Explanation: The Brinch Hansen shape factor can be applied to the Nc values from Skempton for the rectangular footing. Explanation: Brinch Hansen considered the bearing capacity as a plane-strain problem. If φ is found by tri axial test, its corresponding value for the plane strain case can be computed. Explanation: Bowel suggests that the increase of φ in the equation φ plain strain = 1.1 φ tri axial can be computed only for φ greater than 25°. Explanation: Based partly on theory and partly on the laboratory test, Skempton observed that the factor Nc increases with the ratio D/B. Explanation: According to Skempton recommendation, the value of Nc = 5.14 for strip footing when D=0 and Nc = 6.20 for square or circular footing. 7. Which of the following value can be taken [Nc] surface for surface footing? Explanation: Value of [Nc] surface may be roughly taken as 5 for surface strip footing and as 6 for square or circular footing. Explanation: According to Brinch Hansen’s equation, i represent the inclination factor to account for both horizontal and vertical components of foundation loads. 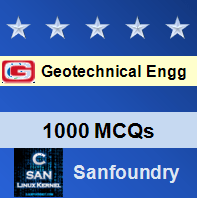 To practice Geotechnical Engineering Question Bank, here is complete set of 1000+ Multiple Choice Questions and Answers.